Comments for feed rhubarb plants? Rhubarb are one of the most misunderstood plants ever. The part you use for pies and other goodies for your pantry are the young leaf stems, which of course, rely on Nitrogen for that fast growth which you require for tender shoots. Nitrogen is best obtained from natural sources, like compost. Compost is a slow release fertilizer, and also has all the benefits of mulch. This is a win/win situation; applying the compost in the fall or spring gives it time to slowly release into the soil around the extensive root system of a rhubarb plant. However, as it's now May, you can still apply a thick mulch of compost which will not only feed the plant for next years crop, but will give it some drought protection too. 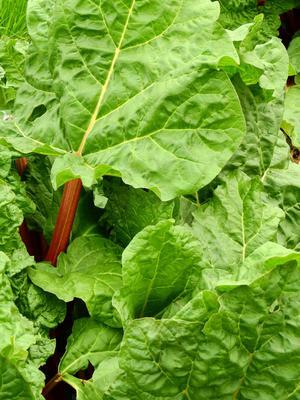 Once you've harvested the rhubarb you need for the season, around ten to twenty percent of the total stems, put some compost around the base of the plant.